We got back yesterday from Catalina where we went to run the Buffalo Run 5K. We were on the island for just shy of 24 hours, but managed to accomplish quite a bit. Colleen finishing her 1st 5K. Congrats! If you’re looking for a quick get away, sign up for the 2011 Buffalo Run. 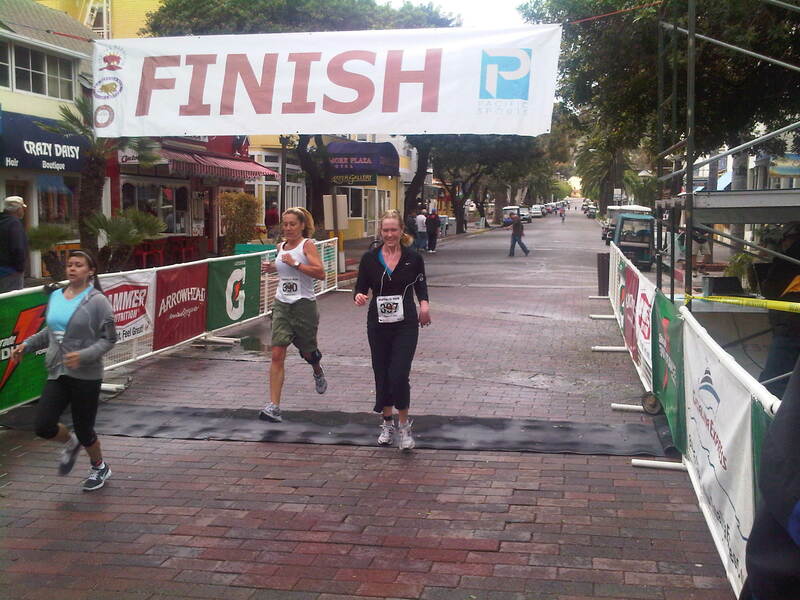 You have the option of a pretty easy 5K – half uphill, half downhill – or a notoriously challenging half marathon. 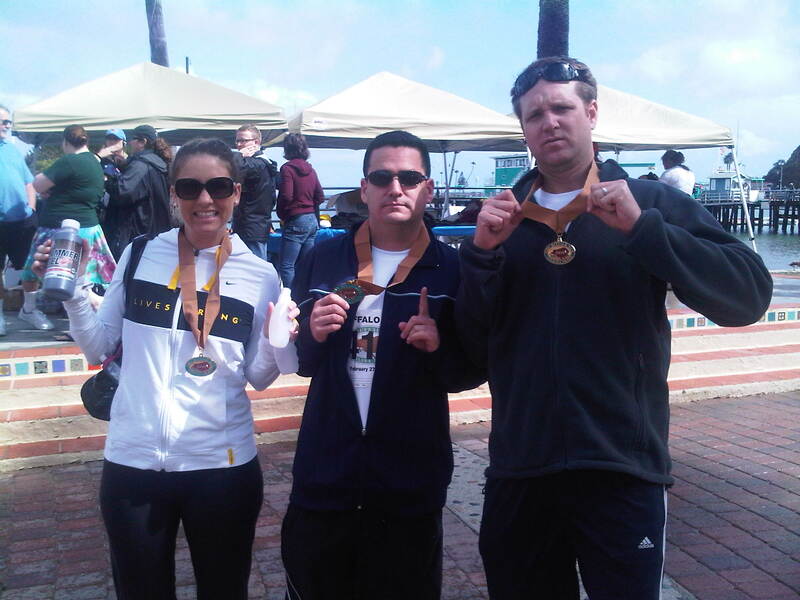 The 5K is a small run which enabled three in our group to earn first place finishes in our respective categories. I’m a really slow runner; there is no way I’d even place in a bigger race on the mainland. If you don’t believe me, check the results here. EL GALLEON RESTAURANT & KARAOKE LOUNGE – This place is decorated in a cross between mardi gras and a seafood shack. The menu is diverse boasting lobster to Asian potstickers. At any minute high school students could break out in a choppy rendition of Baby Got Back on the front-of-house karaoke lounge … there are no set karaoke hours; it goes all day. The prices are mid-grade and the food is good. It is a charming and eclectic place that you could only find on an island or small beach town. STEVE’S STEAKHOUSE – If you’re looking for something a little more upscale that won’t break the bank, Steve’s Steakhouse gives you the feeling of fine dining in a casual island setting. The restaurant is on the main drag on the second floor and affords diners a beautiful view of the bay. The prices are what you’d expect for a steakhouse. I walked in wearing jeans and Ugg boots and no one batted an eye. ERIC’S ON THE PIER – If you want good greasy food, Eric’s on the Pier is the place to go. It is a walk-up grill that features buffalo burgers, Mexican food and funnel cakes … and everything else in between. The cook was extremely friendly and made us feel that he’d make anything – on or off the menu – to please his customers. You can sit outside on the barstools and watch the tide lap up on the beach while sipping a cold one. Scott and me in the cave getting our wicky whacked. 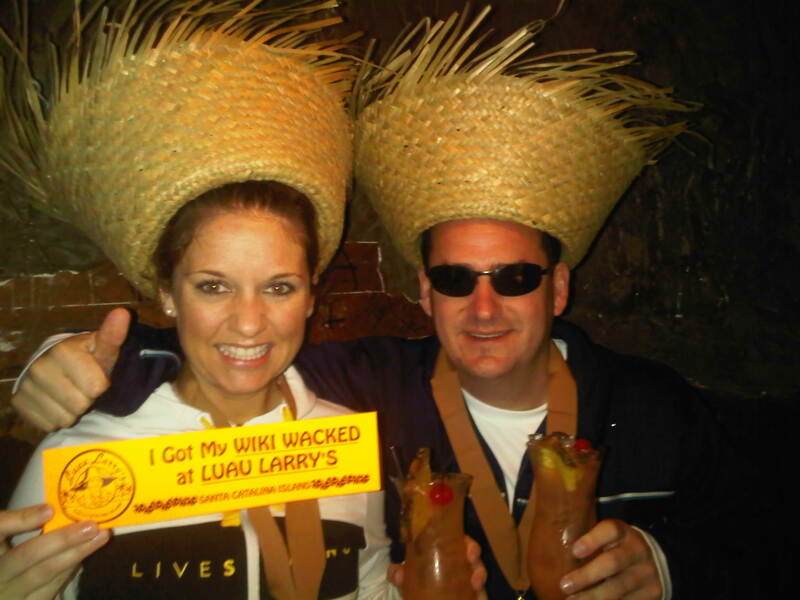 LUAU LARRY’S – If you like to get your wicky wacked, head into Luau Larry’s for the signature Wicky Wacker drink. It comes with a bumper sticker and a cool island hat … and typically a good buzz. Per recommendation of my aunt and uncle, we sat in the cave for our wacking. It really is a booth covered and painted like a giant cave. No further explanation needed. LLOYD’S OF AVALON – We were drawn into this charming candy factory in search of ice cream. On the way in, we passed giant candy apples, decadent chocolates and a wall of sweets. The ice cream was some of the best I’ve had. I got one scoop of butter pecan and can still taste its deliciousness in my mouth a day later. CATALINA CANTINA – Another recommendation of my aunt and uncle. They said we must hit the cantina for a blue shark or rum punch. 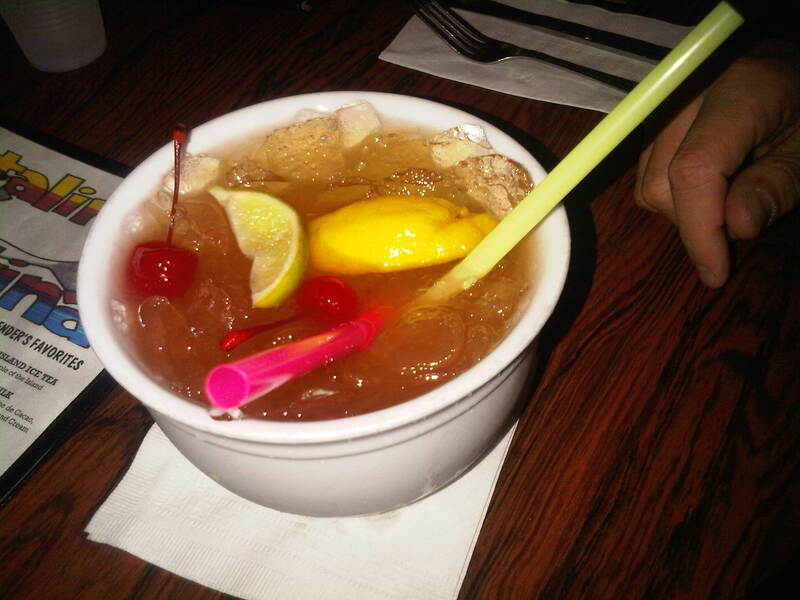 Little did we know, these drinks come in bowls … larger than the bowls in which they serve soup. We only stayed for one but could see how it could be trouble. From the recap, it is pretty clear we should have run the half marathon rather than the 5K to combat our calorie consumption. It rained all weekend, so we just ate, ran and drank, which was fine by us. Next time we will hope for sun and more activity. Catalina is a great little weekend getaway. Hop on that Catalina Express and give it a shot.